The gametophyte of Aglaophyton (formerly known as Rhynia major) had been discovered in the Lower Devonian Rhynie chert by Remy & Remy and named Lyonophyton rhyniensis . In later papers by Remy & Hass it had been thoroughly described [2,3]. However, a photograph of a detail in  strongly suggests an interpretation differing from the one offered there (Fig.1). 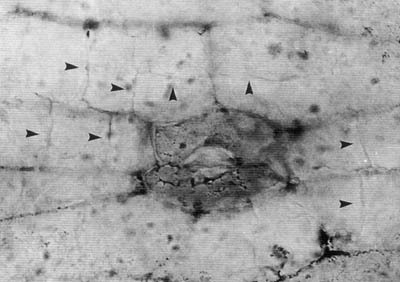 Fig.1: Epidermis of Lyonophyton, arrows (supposedly) indicating “secondary divisions” of cells in the vicinity of a stoma, after [3,4]. 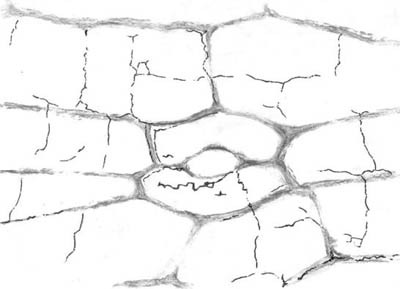 The alleged secondary divisions are really shrinkage cracks, which becomes obvious in Fig.2, where the cell walls and the questionable thin lines faintly seen in Fig.1 have been redrawn for better visibility. Fig. 2: Drawing after Fig.1, revealing the true nature of the faint lines as shrinkage cracks in chalcedony. Hence, the above conclusions derived from this figure in  are not substantiated. The same figure and its misinterpretation have been published once more . Argumenta Palaeobotanica (Münster) 6(1980), 37-72, Tafel 7-13. Argumenta Palaeobotanica (Münster) 8(1991), 1-27, Tafel 1-12. Rev. Palaeobot. Palynol. 90(1996), 175-193. J. Exp. Botany 49(1998) Special Issue, 255-278.